please access the mayan page to see the symmetric patterns which will cause these volcanoes. 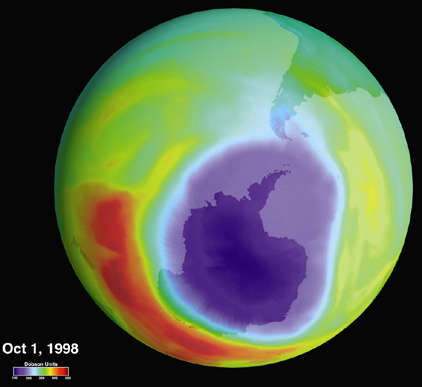 watch for significant depletion of the ozone layer in 2012 and 2013. (1) at the end of 2011 and 2012, multiple volcanic eruptions should produce large quantities of sulfur dioxide (so2) and various aerosols. (2) the short-term effect of the aerosols will be to temporarily reduce global temperatures. (3) the so2 combines with water and oxygen to produce sulfuric acid (h2so4). 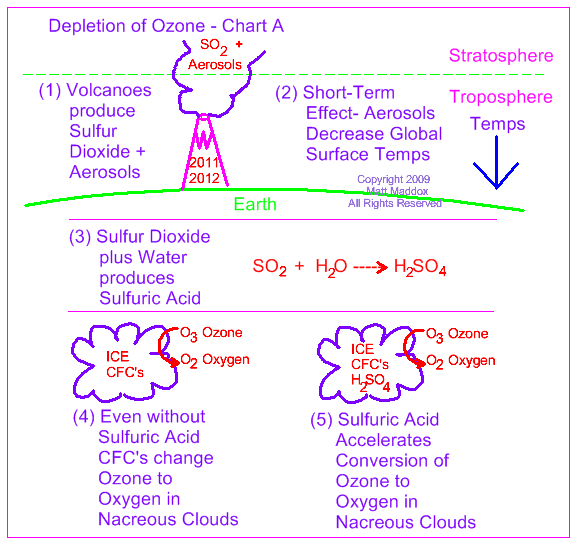 (4) at present the chlorofluorocarbons (cfc's) already present in the stratosphere set up the catalytic conversion of ozone (o3) to oxygen (o2) in extremely cold nacreous clouds. (5) sulfuric acid within these clouds provides more nucleation points for the conversion to occur and greatly accelerates the ozone loss. 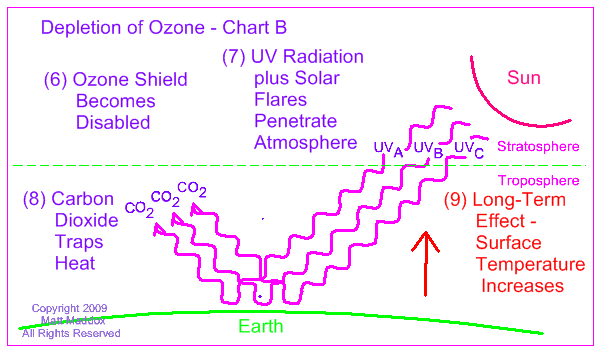 (6) with little or no ozone left, (7) uv radiation at all wavelengths will penetrate the stratosphere. solar flares will overcome the earth's magnetic field and add to the heat. (8) incident heat from the sun will bounce off the earth's surface and be trapped by carbon dioxide (co2) already present. (9) glaciers and polar ice will melt and sea levels, predicted to rise later this century, will begin to rise in september 2012.
for a thorough discussion of the chemistry of these reactions please see dr. susan solomon's article http://www.af-info.or.jp/blueplanet/doc/essay/2004essay-solomon.pdf page 18 and following discusses sulfur-producing volcanoes and ozone loss. it is a 32-page pdf article and takes time to load. another discussion is found in encyclopedia of volcanoes by haraldur sigurdsson copyright 2000 academic press on pages 931-943. the chapter is entitled "volcanic aerosol and global atmospheric effects" and is authored by michael j. mills of university of colorado. 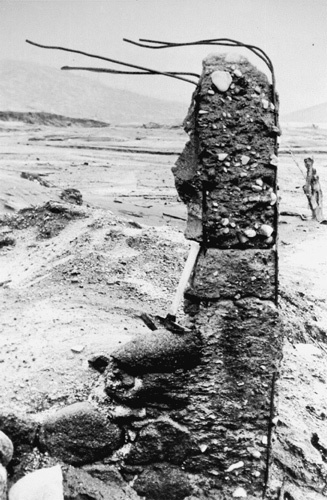 a major eruption of el chichon volcano in mexico occurred on march 28, 1982.
saturn and uranus each lined up with a star in the ecliptic plane and jupiter was at just the right position to create a reinforced "double k" subpattern. meanwhile, neptune was already in line with the center of the milky way. 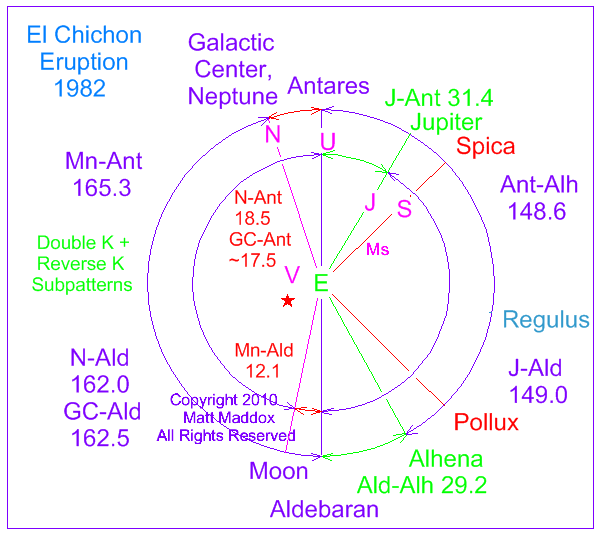 the moon was symmetrically opposite the neptune-galactic center (gc) pair, resulting in a "reverse k" subpattern. note that in the few hours just prior to the eruption, the moon was precisely symmetric with the neptune-gc pair. note the very neat "double k" structure composed of antares, aldebaran, spica, pollux, jupiter and saturn! 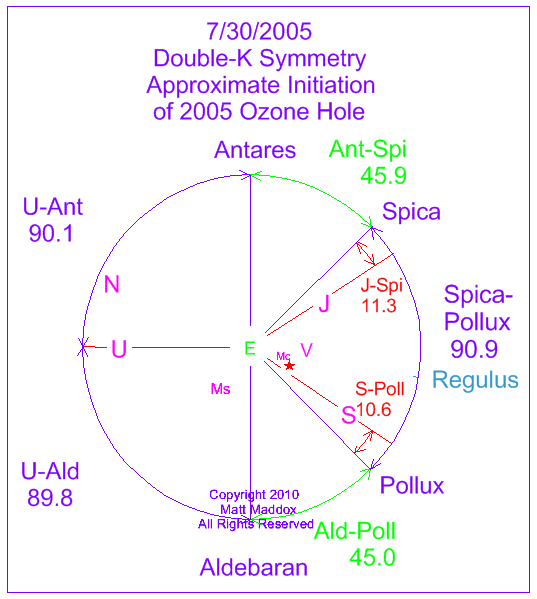 symmetric with this is the uranus-antares-aldebaran "sideways t" pattern. polar stratospheric clouds (psc's), also known as nacreous clouds, form especially in the antarctic, and chemical reactions in these clouds contribute to ozone depletion. it is theorized that certain symmetric astronomical patterns cause these clouds to form.